Kirby Markers speeds up play by up to 36 minutes per foursome. Kirby Markers require less maintenance than traditional markers, saving the course on daily maintenance. There are advertising possibilities created by Kirby Markers. Less effort and less time. Kirby Markers contribute to the efforts of your maintenance crew as well as to your bottom line. You’ll find that your maintenance time will be dramatically reduced. Our markers collapse under lawnmowers, saving your crew from having to pull out fairway markers. This collapsing feature is also mower-friendly, resulting in much less mower blade wear and tear. Another feature of Kirby Markers is their ability to withstand snow, rain, extreme heat, ice and mud. This toughness means your crew won’t have to replace the markers when they are exposed to rugged conditions. Nothing will diminish the enjoyment of golf quicker than a slow round. One of the primary reasons for slow play is golfers continually searching for the right yardage. Our research shows that with Kirby Markers, a round of golf averages 36 minutes quicker than a round with standard markers, allowing for 6 additional foursomes each day. In golf, as in every business, there is a right way to conduct your business and a wrong way. If you manage a golf course, your best practices should include a reasonable speed of play. Our yardage solutions system is proven to speed up play considerably, and in the process enhancing the golfing experience for courses that have implemented Kirby Markers throughout their 18-hole layout. Below is a good, better, best sampling of our recommended layout options. As you can see by the comparisons on the competitive matrix, no other yardage system really compares with Kirby Markers. 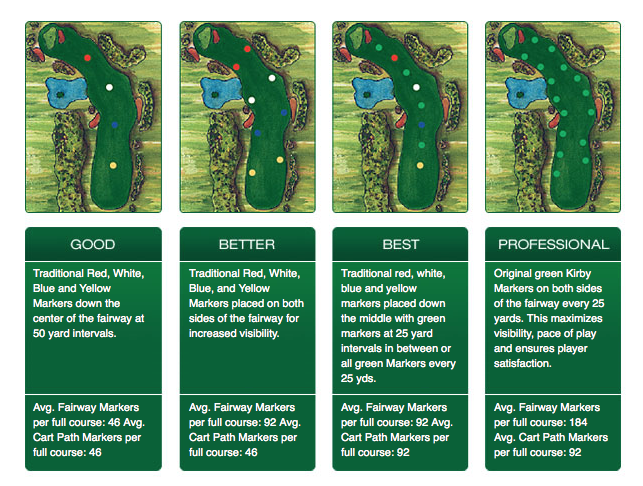 In fact, we are the only yardage system that offers all the advantages of a complete yardage system. Kirby Markers are customizable, weather resistant, offer low maintenance, accuracy, durability, visibility and increased speed of play.